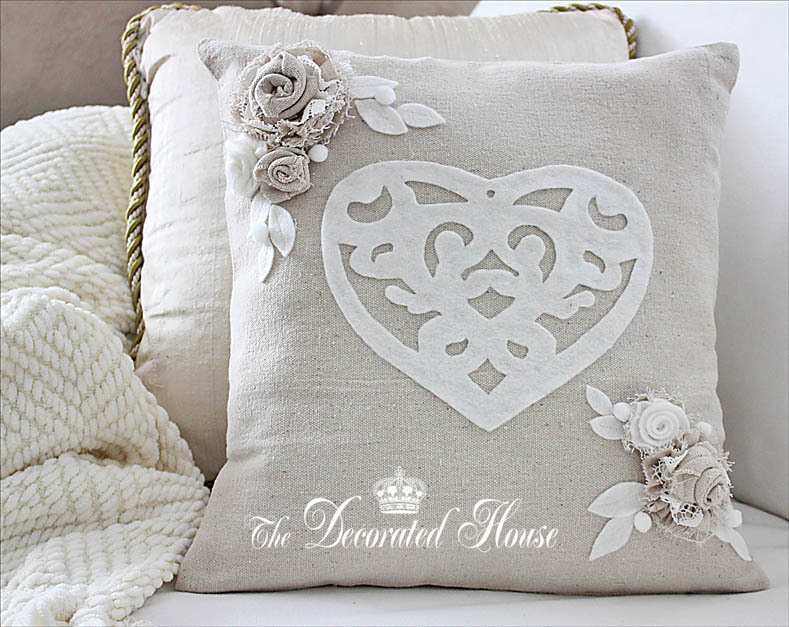 It seemed the perfect time to revisit the post on how to make this charming Heart & Flowers Pillow. It has been a very popular post and with Valentine's Day coming up very soon, I thought it might be nice to show how it was made again. Enjoy! Above is the top of the pillow I made for Valentine's Day decorating. Love having a Valentine feeling with just subtle neutral colors. The tutorial for making the fabric flowers is linked at the bottom of this post. 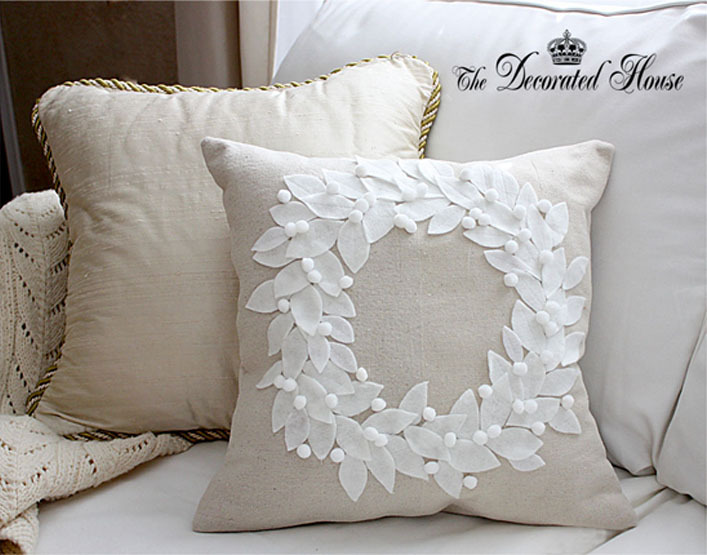 When I saw the pillow shown below on Pottery Barn site, there was something about it that I really liked. It was the neutral color and the fun fabric flowers. 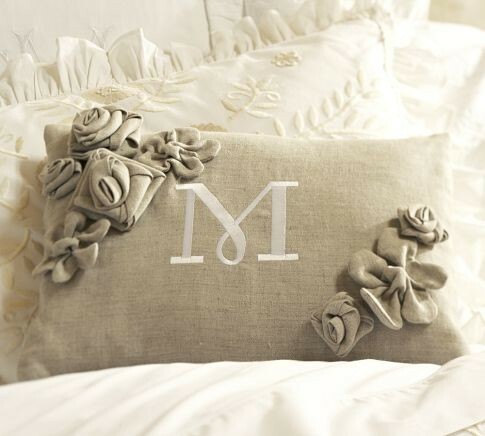 I'm actually not crazy about how the monogram is situated on the pillow. But it gave me an idea of what I would like. With Christmas packed away, I really missed the knock-off PB felt wreath pillow and that is what gave me the idea of the heart cut out of felt. It took longer to decide what size the heart should be, draw out the design and cut it out than anything else. 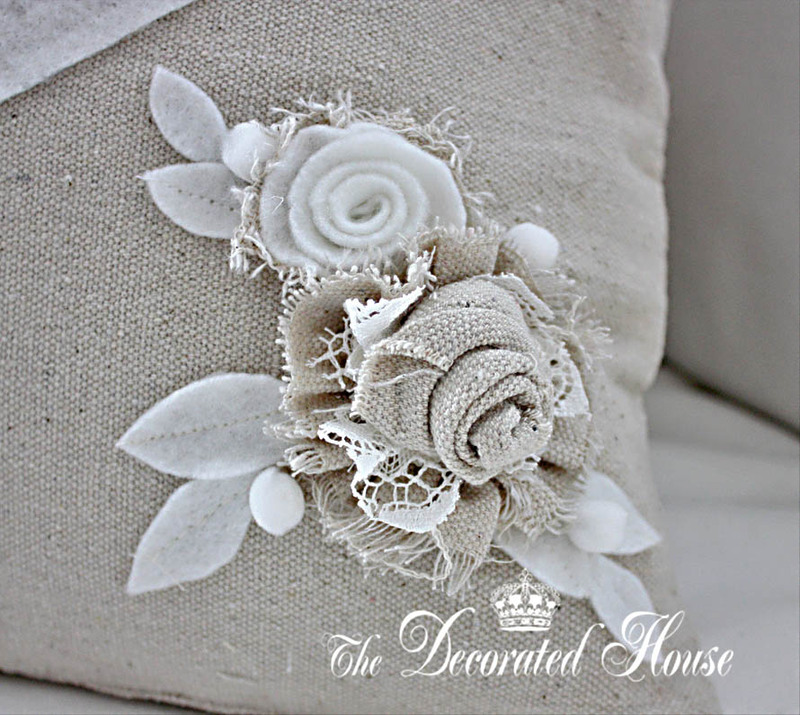 The pillow is made from a woven cotton, and the natural cotton fabric in the flowers is as well. The edges are left without hems so they would fray a bit while I was twisting them into flowers for an added design element, but you could hem the fabric beforehand if that is too rustic for you. Although you can purchase felt leaves already made, they are not difficult to sew up a batch of your own. It adds a nice charm to have a seam down the middle. So just sew a straight line, then cut the curves for the leaves on each side of the line so you have a "vein" down the center. You can see that in the picture below. Since I liked the added interest the pompoms gave the wreath pillow, I added a few as maybe berries or something to this pillow as well. Of course this is not something that is child friendly for pillow fights or for high traffic area. But it's a fun way to decorate for Valentine's Day (or any day) with a subtle touch. Very pretty, Donna, I love it! I love how you did the flowers; I think I would leave them unhemmed, too. While your inspiration is pretty, I think the PB monogram looks off balance due to one too many flowers in the upper left corner. I really like the fabric you used. It looks like my favorite Osnaberg fabric. I love this Donna....love the flowers....beautiful! Your pillows are lovely. I just love neutrals. Donna, your pillow is gorgeous!!! You did a perfect job on it. I just love it! Is there a tutorial that you followed to learn how to make the fabric flowers? 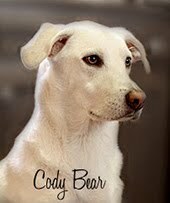 I have been wanting to make them for some time but never figured it out. Oh, and you are right, the poms add that extra layer of fun and unexpected to the pillow. So romantic and beautiful. Loving the roses! You are amazing...that pillow is adorable! Love this pillow and all the accents. Thanks for stopping by. I'm happy to see you enjoyed the pillow and the fabric flowers. It was nice to already have it all done and waiting to come out this year! did you glue the heart to the pillow or sew it? i'd like to do this but glue the heart, not sew. 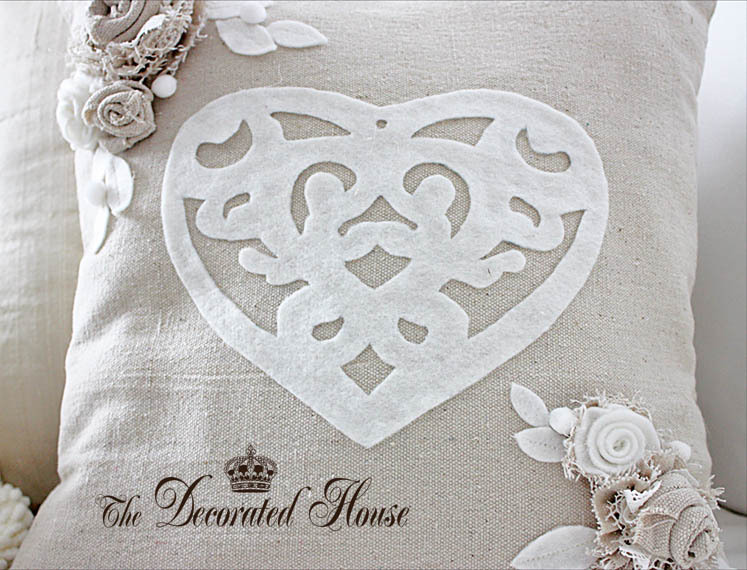 The heart is adhered to the pillow front with fabric glue. The flowers can be heavy so I know what you mean. 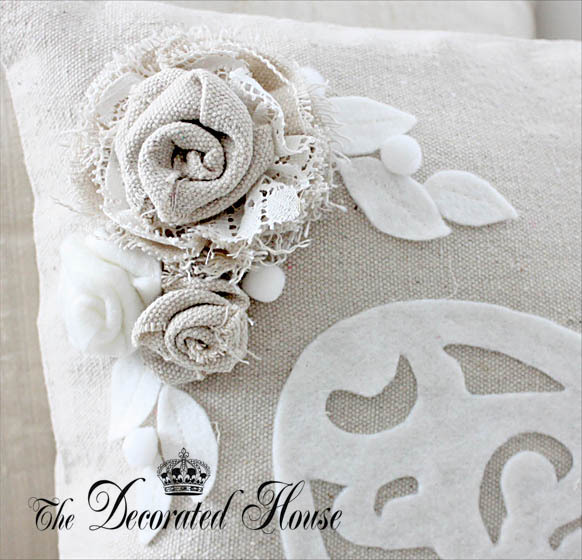 Because of their weight, you can use a small safety pin on the inside of the pillow and then do a some hidden hand stitching under the flower to sew it to the pillow cover. I often just use the safety pins alone, sometimes 1-3 very small ones per flower so that I can take the flower off if I need to wash the cover. These pillows get very little wear and tear, so I have not needed to wash them. I'm so happy to hear that your pillow is coming along so beautifully! Hi Trisha ~ You can use any unbleached cotton, or cotton blend fabric. Each one will have a different amount of texture, from smooth to more texture. You can also simply use the fabric of a drop cloth! You can find them at Lowes, Home Depot and other hardware type stores. If you want it whiter, then you can use a bleached cotton.